Not only is this machine visually stunning, it is also built for purpose. The Fiorenzato Ducale espresso machine is designed to offer the user easy access to components in order to minimise maintenance costs. The Fiorenzato Ducale has a unique design, supply groups on view and is made using strong stainless steel frame to assure a long life span. The Ducale has thermically balanced dispensing groups for proper espresso supply (thanks to its heat exchanger and hot water-heating plant). The Ducale has an automatic water recharge system to make sure the boiler is kept at the correct level, an internal thermostat, pressure regulator and rotary pump which allows the pressure to be adjusted externally. 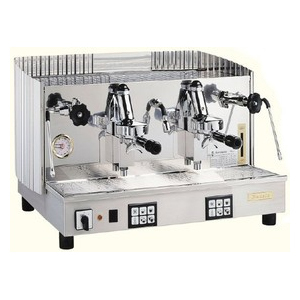 The Fiorenzato Ducale is truely a remarkable piece of equipment which is perfect for cafe's, bars restaurants and hotels. View our Exclusive Package deal here. Click here for our Fiorenzato Ducale Exclusive Package Deal.